10-Day Personal Finance PLR Newsletter Emails ready to be used for list building, autoresponder emails and training your subscribers. Simply slap your name on the squeeze page, monetize the emails with your own offers or affiliate offers and then pop them into your autoresponder tool like Aweber or GetResponse. This is a complete ecourse consisting of Energizing Tricks emails messages with private label rights to help train your customers on the Personal Finance. How Can You Use This Private Label Rights Ecourse To Make Money? Managing your personal finances is a lot easier today with free and paid online software. Having as much bookkeeping automated as possible is very helpful to ensure that you don’t miss anything or get lazy and just don’t do it. These software choices are amazing and will help you. Try a few of them to find the one that works best for you. Remember, the software package that works best for you is the one you like, not the one everyone else thinks is best. If it’s not intuitive to you, you probably won’t use it. 1. Mint – This is considered the number one free personal finance software. You don’t need to spend a lot of money to manage your personal finances. This software also offers a mobile app and it’s great for what it does. Everything is in one place; it can send bill due reminders, integrate with your bank accounts and credit card accounts, and more. 2. Shoeboxed – If you have a lot of receipts, this is a great option to keep track digitally. You can use this software both on mobile and on your computer to keep track in the cloud of your receipts and documents. You can start with a $15 plan or you can move up to the $69 plan. You can categorize the data you scan and store in the secure cloud space so that it’s all fully searchable. 3. BudgetSimple – Need help setting up a budget? This product is simple, fast, secure, and a great way to make a budget. You will save money because you’ll understand your finances a lot better as you get everything organized. Track every part of your income and expenses and get automatic financial tips too. You can even link your bank accounts. You can start free and if you want to you can upgrade to the plus option – that’s less than $5 per month and more than worth it. 4. Your Bank – Most credit unions and banks today offer a lot of financial planning and budgeting resources included with your bank account. Go online and sign up for an online account for free if you haven’t already. If you’re not sure how to, make an appointment with your bank and they can show you what they have. 6. Debt Quencher – This is for people who have credit card debt and want a simple way to pay it down. This software will help you do that. Just enter your balances and interest, pick how you want to pay it down, then follow the plan it provides. It’s that simple. When you choose your software, do test it out. What’s easy for one person to use might not be that easy for someone else. Choose what works for you so that you will really use it and make the most of it. Make sure you can get the next email by whitelisting our email address. You don’t want to miss any of the ten emails about personal finance as we’ll share a lot of great software, blogs, websites, and resources. Next time we’ll let you know about some awesome blogs and websites that teach and talk about personal finance. [YES] Can be Re-titled, Re-written or Re-edited. 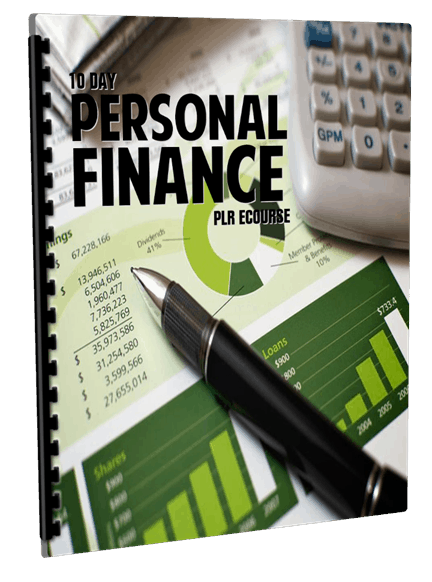 Why Purchase This 10-Day Personal Finance PLR eCourse From BuyQualityPLR.com? We will only be selling 50 copies of this Personal Finance niche ecourse, so don’t waste any time and grab your PLR license while it’s still available for sale. To download the files… Just right click on the links above and select “Save As”. Then unpack the zip files using WinZip or 7Zip.